The San Diego County Sheriff's Department wants to remind everyone to not drive under the influence this holiday season or anytime. 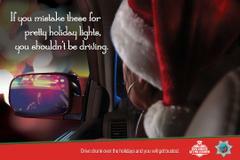 Deputies will be conducting increased DUI patrols from December 14th to January 1st. Impaired driving doesn't just refer to alcohol. It also means marijuana and prescription drugs. If you're caught driving under the influence, you will go to jail. So far this year, more than 1,000 people have been arrested for DUI by the Sheriff's Department. In 2017, deputies arrested 1,225 people for driving under the influence of drugs or alcohol. Funding for this DUI enforcement program was provided by a grant from the California Office of Traffic Safety (OTS) through the National Highway Traffic Safety Administration (NHTSA).